Compare home warranty policies from the top ten home warranty service providers in Maryland. To further assist you in selecting your policy, we have created a graph with a bell curve that showcases the average price of premium and average deductible of the various home warranty policies that are purchased throughout the state of Maryland. View more... The X-axis indicates the price of the premium while the Y-axis indicates the number of homeowners. The start of the curve indicates the number of homeowners who purchase policies that have low premiums. The curve then rises to indicate the number of homeowners who have opted for the average premium and finally dips to denote the number of homeowners who opt for policies with a high premium. The Average Premium of the Maryland is mentioned at the top of the graph. You can also view the Average Deductible that is opted for in the state by clicking on the arrows placed on either side of “Average Premium in Maryland”. We have also calculated the average premium and average deductible price for the major towns in Maryland. Click on the city name to know its average policy premium and average deductible opted for. Review: Stay far far away. Most on line reviews are fakes. Company hires the lowest grade contractors you can imagine and the Memphis call center is a labyrinth of poor customer service that passes the buck. Review: I requested the service on-line, which was very quick and easy. The company promptly contacted me to schedule the repair. The technician arrived as scheduled and quickly diagnosed the problem. He did have the part needed, but assured me that it would be promptly ordered. He was courteous and very knowledgeable. The company representative contacted me to advise me that the part was ordered and gave an estimate of when the part should be available. The part arrived within the estimated timeframe. The technician once again arrived on time and quickly replaced the part. I was very satisfied with the service provided and quite happy that AHS effectively worked in the background to ensure the company was quickly notified of my problem and was promptly paid. This was a very pleasing experience. Review: We have used this service for 3 years now. They have been very convenient and saved us THOUSANDS of dollars. Don\'t use the phone to contact them unless you call early in the morning. All my claims are online and they respond within 24 hrs. This is the best in the industry. Review: On the recommendation of a friend I bought into the idea of purchasing a warranty from American Home Shield. After paying the monthly fee for many months without needing the service, my air conditioning would not push out cold air. I called AHS and received a confirmation number for a technician to service my unit. 24 hours later I had not heard for the technician. I called the tech and he informed me that he had conveyed to AHS that he was not taking any more customers at this time (On Hold). I called AHS and was placed on hold for 15 minutes before a rep serviced my call. I was told that they would contact the contractor to find out why he will not be able to service my call and that they would call me back within the hour. Three hours later I call AHS back, because no one returned my call. This time it took 10 minutes for the rep to service my call. The rep insisted that their policy is to wait until the contractor calls them back to confirm that he could not service my call, before assigning me a new technican. I called for service on a Wednesday and because the contractor has not returned their call, I will have to spend the weekend without a working air conditioner. I asked to speak with a supervisor, but rep would not let me speak to a supervisor. AHS customer service and policies are unacceptable and are not in the best interest of their customers. Review: we purchased a pressure washer August 27 of 2017. 3 weeks ago it stopped running after about 60 hours of run time. We also purchased the extended warranty at the original time of purchase . it should be noted we use this equipment fir a small business and spends thousands of dollars a year at this store in Lavake Ms. we returned the equipment on the day if break down and was informed that in replacement could be accomplished and that th equipment would be sent out repair type following Thursday. 7 days. we signed a paper saying that if it was determined that user error was the fault it could cost up to 125 to repair. Today wenwentnto puckmuo the pressure washer and of course it was determined to be user error and 61 dollars in labor charges and 20 dollars in delivery charges and the pressure washer was NOT repaired. Customer service could only give the warranty phone number and provided. No resolution. DO NIT PURCHASE EXTENDED WARRANTY FROM LOWES. Review: Tech came out and fixed our issue promptly; but we ended up paying twice. After some back and forth with the contractor and AHS, we were able to get our deductible back. Overall - I\'m satisfied with their work and the outcome of the situation. Review: I had AHS for a rental property to handle things easily and efficiently. Last winter during a water emergency they utterly failed and never resolved it. A pipe burst and water was spewing in the basement. AHS was called, told it was an emergency, that water was actively streaming from a broken pipe. When I called them to find out why, a day later, no one had been sent to the property, they said it was up to the companies they called to show up and they hadn't marked it as an emergency. They took no responsibility for their promise to repair emergency issues in an emergency fashion, whether it was AHS or the businesses they choose to use, and the service reps contradicted each other each time I called. I had to call multiple times because each time I asked to speak to a supervisor, it happened to be when no supervisors were on site...which happened at least twice. So, in my experience AHS is very good at cashing checks, but not in responding to emergency calls, not in polite, clear customer service, not in passing messages to supervisors, or the supervisors just don't call back and the lies that each customer service person told when they had me REEXPLAIN everything to them, even though they would have NO ability to help me and were going to refer me to a supervisor who does not exist...I have no respect for this company. I never did get a call from anyone, so cancelled the 'service' and moved on. But they cost me time, money and frustration as I had to pay another company to come out to fix the problem, as they did not. I hired them as a means to avoid delays and expense and headaches and provide a safe residence for my tenant. AHS did not do that. Not did they attempt to resolve the issue though I called several times and was told, at least twice, that they'd have a supervisor call me. Review: The last service call from AMHS was great. The contractor called immediately and arrived very quickly. They were very good. The service call I have now to Sears is making me wait 5 days before they can come out for my refrigerator. My food will be spoiled by then as my fridge is not keeping the food cold anymore. Sears is one of the worst contractors for service call times. They can never get someone out soon enough. I have 2 small babies who need cold milk. Not sure what to do now besides wait for Sears. Review: All representatives were timely in responding, arriving timely and completing the job in a timely fashion. All were pleasant and advised me on what was needed. Review: We have 2 properties with AHS and have been very satisfied with their service, the vendors who represent them and the service they provide. Review: The customer service reps were pleasant, the contractor was nice enough. This is our first claim and hope if any more it will go the same. The service was completed in a timely manner by a very qualified and personable technition. There was no hesitation by AHS about repairing the machine. Thankfully my house is comfortable again. Review: Customer service availability is horrendous and not user friendly at all. Some of the companies AHS use for repair services have bad customer relations and often times the technicians they send out to home calls are unfriendly and standoffish. Review: We have been AHS customers since 2006. From 2006-2009, service was good. Since 2009, and especially in last 2 years, we have noticed consistently poor customer service, no follow-through on commitments, no returns of promised calls by supervisors, issues are not resolved in a timely manner, poor quality vendors that are dispatched to fix issues, etc. Tired of waiting for 30-45 minutes to talk with someone, and customer reps who disconnect us while transferring to a supervisor. Final straw was waiting 6+ weeks to get my covered washing machine fixed, and being charged for service fees the supervisor agreed to waive. Never again with AHS. Review: I take excellent care of my home and have regular maintenance done my appliances. In the time I have used AHS (for a total of 6 years), I have found that within the last 4 years, the service level as well as the number of items covered for repair have decreased, while the premiums and co-pay have increased. At the end of my current contract, I will discontinue my relationship with AHS, and seek another service company. In the past I had recommended this company to two friends and each person who had a service contract with AHS was not pleased with the service, the contractor answering the call have a low level of expertise or, the customer having to request another service call for the same issue, and being expected to pay another fee for a repair that was not made or partially completed. Review: CUSTOMER SERVICE IS EVERYTHING. IF YOU DONT HAVE GOOD CUSTOMER SERVICE. I'm not enterested. I have had a terrible time with customer service. From the beginning of my contract I let them do an electronic debit. I became so frushstrated with customer service I canceled my services with them. So not they are holding a $51.62 payment over my head. I no longer had a contract. I was not going to let them take anymore money out of my account . So why do I owe them money? I asked are you telling me I can't cancel when I want to. They say no, do I don't owe you anything because I cancel before another payment was do. Now of course the cancellation department was nice when they called she asked if I would continue my contract. I told her I would give her a call. Well I found me another company and really never gave AHS another thought. Well they were thinking about my money because they did not send me a bill they just sent the bill to Transworld Systems. So now there just being ugly. I will fight them on line facebook twitter. I will send my last psent to the credit people showing they were taking the money out of my account until I said STOP I CANCEL YOUR SERVICES. Always LOIK FOR GOOD CUSTOMER SERVICE, I SAY AGAIN IT WILL MAKE A COMPAMY OR HURT IT. Review: I recently had an experience with your customer service in resolving an issue with a previous property that I was still being billed for.The issue was resolved rather quickly and I was very satisfied with your efforts. 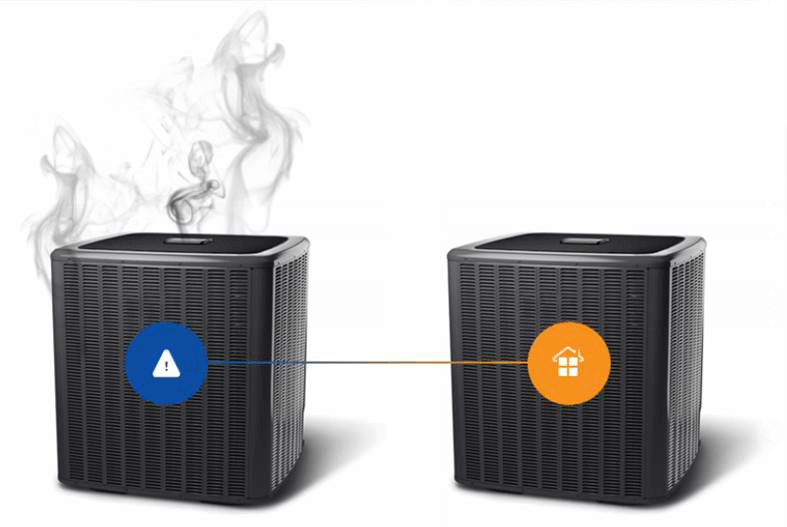 Review: Had 2 different service calls for central air not working. In both cases the service companies said that it was due to poor maitenence and had to pay $220.00, than $80 for cleaning services etc. on top of $60.00 deductible. One service company told me flat out that he has never seen AHS replace a central air or HVAC unit for anyone and will do whatever it takes to frankenstein and jimmy rig whatever unit you have. Just heard that I can get the same type of coverage thru my gas/electric company for about the 10th of the cost. Review: I have been a long time client of AHS and I am eternally grateful for the service. The representatives are willing work with you to schedule appointments and provide outstanding customer service. This has been my experience and I would recommend AHS to family and friends. I have not had to rely on them often but when I do, it is a relief to know they are there.